It tastes as decadent as it looks! Your guests will never guess what the secret ingredient is in it! This dense chocolate cake is rich, dark and creamy (with an almost molten center!). Yet, it is low in sugar, has no added oil or butter (NONE!) and instead of flour, I use…. organic black beluga lentils! Not only are lentils a powerhouse nutrition staple, but black beluga lentils are the “champions”of all lentils with more protein and more fiber than all other types of lentils! In this recipe, I use canned organic black lentils because it makes it so quick to make on the spot but I have also made it with dry lentils that I cook from scratch and I give you that alternative as well. The whole process entails throwing everything into a food processor! You have to taste it to believe it–My guests rave about it and I think (actually I know!) you will too! One little tip if you plan on making it in advance and freezing or refrigerating it. When you get it back to room temperature, place the whole cake in the microwave oven for 2 minutes on high and OH MY GOODNESS you will get that molten center overall creaminess you had when you took it out of the oven…..outrageously delicious! * you can also cook your lentils from scratch: Boil 3 cups water, then add ⅓ cup dry black beluga lentils and cook for 20-25 minutes, until tender and the water has mostly evaporated. Rinse and drain. It will make 1 cup cooked lentils or the equivalent of a 15 oz can. Preheat oven to 350. Line the bottom of an 8” springform pan with dry wax paper to fit and "grease" it with a little canola oil. Place chocolate chips in a small microwavable bowl, heat on high for 1 minute to melt and stir until smooth. Place drained lentils, eggs and sugar in the bowl of a food processor. Process until creamy and smooth. Add melted chocolate and pulse again to blend until smooth and creamy. Pour the batter in the prepared pan and bake for 15-17 minutes. I leave mine a little soft/molten in the middle, it's OK, as it will continue to "bake" even outside the oven for a few minutes so do not over bake!! Unmold by unfastening the springform pan first, and take it out of the way, then place your serving platter over the top of the cake and turn over. Gently peel off the wax paper and dust with confectioner sugar. For this cake, I use a non-stick 8″ springform pan that I line with pre-made-to-fit wax paper liners that I buy in bulk or you can cut it to fit yourself. Catherine can I make this the day before my meeting? What is the best way to store the cake? My 15 oz can of lentils was more than 1 cup. I used drained can and recipe seems to work and taste good. But was using the can too much lentils vs 1 cup ? My batter was very thick . Thanks for any suggestions. I’ve made this twice and it’s worked perfectly both times. I don’t have a spring-form pan, so I cut a round of parchment paper to fit the bottom of a regular 8″ round cake pan, put the parchment paper on the bottom of the pan and sprayed the pan lightly with cooking spray. After cooling, the cake came out of the pan perfectly. I topped it with a little powered sugar and some pomegranate seeds. So yummy!! Thanks for this recipe! I made it for my friends and they loved it and make it as well now! It’s been awhile since I made it and I just made it again tonight and it turned out rather crumbly. Any thoughts on why that may be? What amount of chocolate (by weight) do you usually use because I wonder if my chocolate measurement was a bit off? Thanks for your unique and healthy recipes! You are very welcome Sarah, I am so glad you love it! I agree with you, the source of the crumbliness this time, must be due to the chocolate. What brand and how much, did you use this time? I typically use 1 1/2 cups Ghirardelli bittersweet chocolate chips (60%-70% cocoa) equivalent to 250g. Thank you, thank you, thank you, for posting this! I am gluten, dairy and soy intolerant due to an auto immune condition and have recently been diagnosed with GDM. I have been craving chocolate cake for the longest time but all the gluten-free flour mixes that I have tried caused my blood glucose levels to spike. I made a batch of this cake yesterday and my levels are perfect, allowing me to indulge in as much cake as I want. What a wonderful comment! Catherine was so touched to read your words and she asked me to let you know, since while she is away in France she is not able to answer you directly. She will as soon as she is back home! Hi, can I use this recipe to make cupcakes instead of a large cake? If so, how long do you think I should cook them? I’ve now tried quite a few of your recipes and I ❤️ them all, they are delicious and simple. Thank you, thank you, thank you ? I don’t see why you couldn’t try this recipe in the form of cupcakes but I can only guess how long you should bake them for, maybe 5-8 minutes? I also have other little chocolate “cupcakes” that you might like as well. Let me know how it goes! I always love to hear! This was delicious and so easy. I used a ceramic torte or cheese cake pan. I did use the parchment paper and it flipped easily out of pan. So so yummy. Oh yeah, and I used Goya black beans with low salt…couldn’t find Beluga. Amazing!! Simply incredible—and so rich! I had not heard of black beluga lentils before your recipe and was excited to try them. I hunted them down in my local grain/pulse shop and now keep them in my pantry as a staple! My children, my husband and my friends just loved the cake too! I think it´s the perfect choice for a nourishing birthday party cake as well. I might try that next! I lentils but I don’t think they’re black. Would the green ones work in this recipe? Hi, love this recipe. I just wondered if you can also suggest other cake options using the lentils and eggs as a base? I have a daughter who doesn’t like chocolate (oh the horror!!) and am interested to know how you think this base would work with other flavour types. Thank you Carly! I haven’t yet tried to use the lentils with other flavors as they blend so perfectly with the chocolate –but of course!!! 🙂 — but I will take it as a challenge, if only for your daughter, as I love the suggestion! I made this for my bunko group last night—It was a hit…..Love it when friends ask for the recipe! I did use organic black beans because I couldn’t find lentils, and my spring form pan is a 9″. It was wonderful. And love that it is gluten free! One of the ladies has celiac’s, so everyone was able to indulge! I made some home made whipped cream to dollop on top! Can’t wait to try another of your recipes for next month’s get together! I’m using the black beans today as I also cannot find the lentils… Hopefully it turns out wonderful! Thanks for letting me know your replacement gives me more confidence as I embark on this Valentines Day! Good luck Connie! I am sure it will be delicious!!! 🙂 happy Valentine’s day! Listing to your husband right now at the Worksite Wellness Confrence although I can’t stop thinking about the picture of this cake that he yet showed……can’t wait to try this and surf your website for more recipes!!! Thank you for this! I can’t imagine anyone not loving this cake. Absolutely amazing – do not hesitate. Make this cake, be happy! This is most divine, and yummylisious! Today is my husbands birthday, so I made this awesome cake with lots of raspberries for breakfast. Huge hit with all three of us including of course our little one ( she carefully collected all raspberries and put them back on momies plate, good that the chocolate cake itself is so nutritious ?). Will definitely make it again, since on top of everything it is fast and easy to make. I did reduce the sugar some. This is a fabulous cake and so simple to make even if one cooks one’s own lentils., as I did. Your site is beautiful and I see many recipes I’d like to try .thank you. Thank you Anna! Your words went straight to my heart! How did you hear about Cuisinicity all the way from Denmark? I think it was because I was searching for flourless cake recipes and your chocolate cake came up. I’m glad it did ? The first time I made it, I didn’t bake it long enough but the second time it was perfect. It is everything a chocolate cake should be, rich, decadent and delicious and bonus points for being guilt free. I brought it for a gathering and came home empty handed, it got devoured, everyone loved it! I am delighted to hear that Kristin! Thank you so much for letting me know! It is one of my favorite creations! My most favorite of all, because it is ridiculously rich-tasting with amazingly nutritious ingredients (vegan at that!) is my Crème au Chocolat? If you haven’t tried it, oh MY GOODNESS, you JUST HAVE TO!! it’s a cinch to make and decadently delicious and fantastically nutritious! Hi Sandra! I am delighted to hear you loved the cake! I think you are right in saying that the lentils need to be cooked through–I don’t know exactly what you mean about soaking them, as I don’t even do that before I cook them when I cook them from scratch. I just make sure I cook them thoroughly. if you can find the canned lentils, they are already cooked for you and all you need to do is rinse them well and drain before measuring and you’ll be all set. I am delighted to have you at the Cuisinicity table and send you a BIG WELCOME!!! bonjour ! superbe! très étonnant , qui penserait à un gateau avec des lentilles? personne , pas même …Colombo!!! merci pour ce magnifique et tasty gateau , à faire et à refaire!!! Haha, Martine, je savais que ça vous plairait!! J’adore aussi! Ces lentilles sont si humbles n’est-ce pas! Thank you for your advice. I will bake it soon for my son-in-law and let you know about it. Also, thanks very much for the specific instructions about telling when done. For the past several years, I have had Christmas dinner catered for health reasons involving my lack of former ability to whirl around the kitchen and do everything myself. This year I am hoping to do it myself, mainly using your recipes. I know my family will feel blessed to enjoy a special dinner made with your recipes. It would be great if you shared some holiday dinner menus that can be mostly prepared ahead of time with us. Again, thank you for your contributions to making delicious dishes that are also healthy! You are so welcome Gail! I will post some holiday dinner menus around the holidays just for you!! Delicious ….. amazing…. will make many more times! In the oven right now – I had to use my stick blender…. I think I am going to have to save up for a food processor – what size do you recommend? 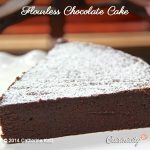 I want to bake the flourless chocolate cake plus many of your other recipes. They all look luscious. While looking online for a springform pan, I see that many of them leak. A few say they are leakproof. The Kaiser Gormet 9 inch springform pan descrtion says this Kaiser pan is engineered to be leakproof. Found it on Williams Sonoma site. 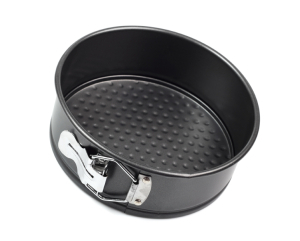 However, this particular pan does not come in the 8 inch size. Will you please recommend an 8 inch pan? Or suggest how to enlarge the cake? Thank you for the most enjoyable time I’ve had just reading your recipes! Thank you Gail for your wonderful words! I bought mine at a special chef equipment store, years ago and never had a problem with leaking. I love Williams Sonoma so I am sure the 9 inch pan you bought will be great. I would suggest doubling the recipe and increasing the time in the oven to make up for it. I can’t say exactly how much, since I have never done it but you should check periodically after about 25 minutes and see if the top is a little settled, while still a little soft/molten in the center. Let it cool completely before unfastening the sides and turning over onto a platter. Please let me know how it goes, I would love to know! I almost never bake, but I want to try this because it looks so easy. But I don’t have a cake pan. I do have a silicon muffin pan, and I’m wondering about making cupcakes. Do you think it would work? Yes Lara! I think that will work just fine! The cake won’t have the consistency of a cupcake, more of a creamy almost molten center chocolaty delight! let me know how it goes! I always love to hear! This cake is so delicious and so simple to make! I follow a low carbohydrate diet and this hits the spot! Thank you Amy!! It’s one of my very favorites too!! Hello Catherine – I’d like to try this recipe but have to use a substitute for the black lentils you mention as they are not available where I live. I thought I’d use canned Cannellini beans or chickpeas. Would you know the weight of the drained content of the lentils contained in the 15oz can of black lentils? Also, if I cook up some lentils (a whole lot), how much would I weigh out to make this recipe – the same question I guess! Hi Barbara! I answered you directly via e-mail but just in case someone else has the same question, I will reiterate that you can use regular lentils if need be and these, you can find everywhere. You can cook them according to package direction and use 1 cup, cooked, drained. I hope this helped!! This cake is delicious! I added some cinnamon, nutmeg and ground cloves to the mix. After trying it for the first time today I have already sent the recipe off to my daughters. What a lovely touch with the spices! I love it! I hope your girls love it too! Hi Barbara, it’s 1 cup cooked (1/3 cup dry triples in size). Let me know how you like (love!) it!! I made it this weekend and i definitely was a hit. My husband keeps taking slivers! Whats the best way to store? YAY!!! That’s wonderful Barbara! You can refrigerate it or freeze it but the when you take a slice out, put it in the microwave for about 20 seconds so that it can get back to that luscious almost molten state! Thank you so much for your lovely comment! I made the flourless chocolate cake and it was a real hit. I added almond extract to the first one. I’m still experimenting. Do you have the nutrition information? Wonderful Susan! A little pure amend extract sounds absolutely lovely! Here is the nutritional analysis: one slice is 270 calories, 31 g carbohydrate and an astounding 11 g protein, with 7g fiber which is just awesome! My pleasure Colleen! My husband got such wonderful feedback about that article too, I wish we could read German! Thank you so much for your lovely words!! I should say Danke sehr! Amy, here is the nutritional analysis: one slice is 270 calories, 31 g carbohydrate and an astounding 11 g protein, with 7g fiber which is just awesome! Have you calculated the nutritional facts for this? I would love to know! YAY Rob!! I am so happy to hear that! It always amazes my guests too when I tell them what the ingredients are!! Just made this cake for the first time. Note to all skeptics: You will be converts. This recipe is incredible. I would serve this to guests in a minute. Thank you Liz for your lovely comment! It makes for a very elegant dessert indeed and your guests will never know what your secret ingredient was. Of course you can boast about it afterwards–they’ ll be astounded! Ce gâteau est Excellentissime!!! Je l’ai transformé en muffins (16minutes de cuisson), et tout le monde a adoré! Y compris mon mari, chef cuisinier, qui est difficile…. J’adore cette recette. Je voulais vous demander si je pourrais la recopier avec votre autorisation pour mon blog plus tard? Je suis en train de le mettre en place actuellement. Suis tombée sur votre site via votre mari: je fini mes études de Health Coach à IIN (Institute for Integrative Nutrition à NYC), et je veux aller dans les écoles en Suède, parler aux enfants…. Quel gentil commentaire plein d’enthousiasme (j’adore!!) et quel beau compliment venant de vous qui êtes spécialiste en nutrition (J’aime beaucoup IIN, they always give my husband such a warm welcome!) et aussi de votre mari, chef cuisinier, WOW!!! C’est un plaisir pour moi de partager tout ça donc absolument vous avez mon accord pour recopier ma recette, avec un link sur mon site, ça serait super! merveilleux que vous vouliez parler aux enfants de l’importance de la nutrition. je pense que vous devez deja être au courrant de nos programmes “Nutrition Detectives” et “ABC for fitness” pour les enfants de 8-12 ans. Sinon, j’ai un link sur mon site sous “Programs”. Voilà, encore merci pour votre commentaire, la seule chose, c’est que je ne m’appelle pas Martine, je m’appelle Catherine!!! PS : seul Colombo devinerait les ingrédients de cette merveilleuse recette !!! …..et encore… pas sûr! !!! Merci Madame Colombo!! Vous allez adorer mon nouveau blog cette semaine où je suis vraiment une grande “Colombo” moi-même! Perfect plan!! can’t wait to hear! Hi Shirley! Delighted that you loved it! Are you asking if you could use 1/4 cup sugar instead of 1/2 cup sugar? I say go for it! I always love to “push” on the nutrition side as much as I can and I felt that I already went as low in sugar content as I could without affecting the sweetness–taste-wise– just sweet enough but not too much so. Nutrition wise, absolutely better if you can lower it yet a little more–good for you and please let me know if it still tastes wonderful! I agree agave syrup may be too liquid for this batter. Wonderful comment! Thank you! keep it coming!! Thanks for your thoughts and follow-up. The next time I make the Flourless Chocolate Cake recipe I will reduce the sugar to 1/3C and I will follow-up with the results. I haven’t read through all the comments on this recipe. Maybe I should! I made th e Flourless Chocolate Cake today and it is very yummy! I love chocolate. Love it! I love that this is gluten-free and overall healthy! Celiac disease runs in the family (both my grandmother and mother); not just gluten-sensitivity. I am not gluten-free but I am aware that someday I may need to be! I am not a cook or a chef; I simply follow recipes. With that in mind, I would like to know if I can reduce the sugar in this recipe by 1/3-1/2, or if I can use Agave. I don’t usually use white sugar (in fact, I was very surprised this week to find out that sugar now comes in 4# bags, no longer in 5# bags). I was concerned that if I used Agave it would be too runny. Any thoughts or suggestions? Made the cake today, absolutely delicious and of course nutritious too! All of my family loved it. Just was wondering if I could add a little bit less chocolate and replace some with cocoa powde? Thank you Mahnaz! I absolutely love this cake! I suppose you could replace some of the chocolate with cocoa powder. Are you asking because you would like to make it yet a little more nutritious? To that I say, good for you, go for it, it’s worth a try! It would indeed increase the protein even more and lower the sugar content which is already relatively low, so just make sure you do not sacrifice the taste or texture and experiment with substituting a little amount at a time. Having said that,the current nutritional profile of this cake is already astounding (see the values in my comment above) so I decided not to tinker anymore with it, myself. I once had to make it with less chocolate chips (a just a little over 1 cup instead of 1 1/2 cups) only because I didn’t have enough in the house and we just HAD to have it for dessert (! ), and it was still delicious, just a little less rich, so you could simply try that. oh and Jo, thank you for that lovely recipe! what a beautiful site! Hahaha! I love your question Jo and I hope others chime in, but that’s exactly how I feel about a lot of those “good for being healthy” desserts out there! You will not feel the same way about this cake, or any of my other desserts for that matter! I am extremely picky about that! It has to taste luscious or it just won’t make the grade! I CAN’T WAIT for you to try it! So excited! Jo- Give it a shot, you will NOT be dissapointed! im not one to sacrifice flavor either but this recipe will have you coming back for more! It”s definatley something I will keep making in the future. Yup – I picked those up today (plus red for the soup tonight) – this is on the menu for the weekend- I think you have cooking instructions for french lentils under a salad recipe – will look it up! Thanks. Yum! I had a 10″ pan so I doubled the recipe and the time. Can’t wait to serve it tomorrow at Friday night dinner! Oh wow! I am so glad you did that! How was the baking time for you? I think you are going to wow everyone at your Friday night dinner! Do tell, I can’t wait to hear! Doubling the recipe and the baking time for a 10″ pan worked perfectly! It was a big hit and I made it for Rosh HaShana dinner, as well! My guests were wowed and it was a great way to bring in the New Year! Thank you for all the great recipes!! That’s great Caroline! Such a festive occasion! I was even thinking that would be a good cake for Passover right? Hmmmm… A complicated question! 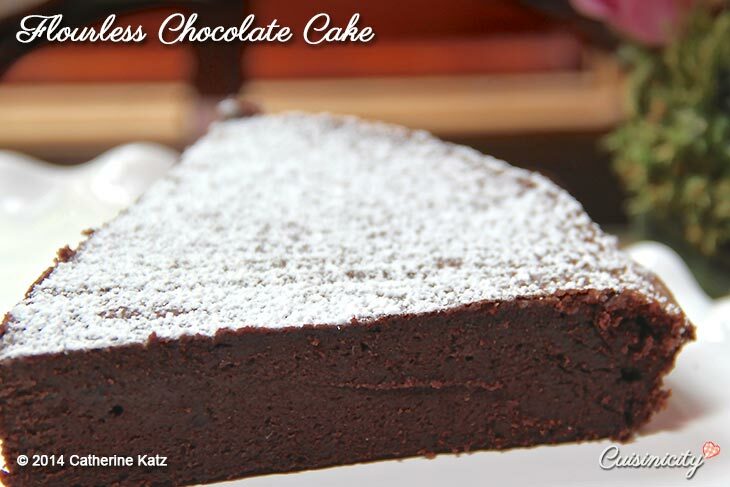 Sephardic Jews ( Jews of North African and Spanish origins) could make this yummy cake for Passover. But Ashkenazi Jews (Jews of Eastern European descent) do not eat beans and lentils and other similar foods such as seeds, corn, rice, etc… on Passover, so this recipe would not work for them. Lucky for me, my husband is Sephardi, so I can enjoy this recipe on every holiday! Thanks again! That’s fascinating Caroline! Thank you! I am sephardic myself so this one is in for me too! Do you know what the stance is on corn polenta? I make delightful pastries with almond meal and polenta http://cuisinicity.com/orange-polenta-petits-fours/. Would those be accepted? I couldn’t find a reply button option on the question you posted below, so this reply is in response to your question. Regarding the corn polenta on Passover, like many things it depends how nuanced a person is when it comes to the laws of kashrut on Passover. Technically, polenta would be acceptable, but I think you would be hard pressed to find a package with kosher for Passover certification on it (at least in the States), Regardless, I am sure the pastries are delicious and I will have to try them! yes! the next best thing for this recipe is French lentils. Can you find those? I am having a heck of a time finding black lentils – I found all the others! Can I substitute another lentil? Do you think this would work well with a sugar substitute (such as stevia)? Any idea of the carb and protein count? I’ve tried a flourless chocolate cake recipe made primarily with eggs, but do love lentils and am interested in trying this one. Thanks! I don’t know if stevia would work in this recipe, only because I just never use sugar substitutes. Of all of them, I understand that stevia is the better substitute if you are going to go that route, so I think it’s worth a try! Do let me know how it goes! As for the nutritional analysis, one slice is 270 calories, 31 g carbohydrate and an astounding 11 g protein, with 7g fiber which is just awesome! Wonderful! My pleasure Allyson! Let me know how it goes-I always love to hear! Very tasty, this will definitely be finding a place in the desert rotation. YES! I am delighted to hear that! haha Colombo! ça devait être ça!! L’important c’est qu’on dirait que vous vous êtes régalée quand même!! This is the Cuisinicity recipe I’m most excited to try. We all love chocolate and we’ll love it more if we can replace the guilt with lentils. I’m game and will report back. I say YES to replacing the guilt with lentils!! Great line Liz! Seriously, I just heard from a friend of mine whose 3 year-old LOVED this cake and asked for seconds and this mom was telling me how good she felt “indulging” her little one with this yummy chocolate cake while knowing she was really nourishing her lentils that she would never otherwise have. So, YES to indulging and NO to guilt, nice combination right?! I can’t wait for you to try it Liz! Thanks for your wonderful comment! Wow! vous êtes super rapide! Fantastique!! La seule chose qui m’étonne un petit peu c’est le petit croquant sympathique auquel vous faites allusion!! Peut-être que vous n’avez pas assez fondu le chocolat? En tous ca, c’est une bonne petite variation! Normalement, je fais bien fondre mon chocolat afin que tout soit bien lisse et très onctueux comme une crème épaisse! J’adore vos gentils commentaires Martine! encore moiii!! je viens de goûter votre gateau aux lentilles , un dé li ce!!! fait en un tour de main, il y a même un petit croquant bien sympathique, on ne se doûte absolument pas que la base est réalisée avec des lentilles , je n’en reviens pas!! à refaire!! Merci ! je vais recommander cette recette à mes ami(e)s ! bonjour , je ne peux presque pas y croire , des lentilles et cet aspect-là , alors je fonce!!! merci ! faîtes-vous appel à un photographe professionnel? ou alors vous avez tous les talents!!! Allez-y vite, foncez!!! Vous êtes adorable! Je ne sais pas si j’appellerais ça du talent, mais je prends moi-même mes photos, quelquefois je l’avoue, en courrant (! ), parcequ’il faut que je garde le plat chaud avant de le mettre sur la table, alors ces fois-là….c’est la course! Merci encore pour votre gentil mot! Love, love, love this recipe. I made it for the first time today and it was so easy to throw together. We are a busy family, so simplicity is a must for us. My 3 year old even asked for seconds and I cant blame her! Little did she know she was eating lentils! Rich, tasty and healthy all rolled into one recipe. Tracy, that makes me sooooo happy! I love that your little one also loved it! Thank you so much for your wonderful comment, it made my day! Thank you for publishing this recipe! I’ve recently had to give up eating food with gluten, and I miss chocolate cake most of all. I am so glad! Please let me know if (that..) you love it! Actually I have never tried, but what an interesting question you opened up for me, thank you! Your question prompted me to look into it and I just found this fascinating article that describes the pros and cons of using flax seeds as an egg replacement (http://www.veganbaking.net/recipes/egg-replacers/flax-seed-egg-replacer). To tell you the truth, because I am not a vegan and because I like to use eggs in my baking, both for their nutritional profile but also for how well they “behave” in a pastry batter, I had not thought about flax or chia substitutes. But you are right, how lovely would if be for my vegan friends to be able to make this “decadent” chocolate cake as well? It is definitely worth a try and I will do that the first chance I get and get back to you with the results! Thank you again, you are my very first comment on my brand new website!